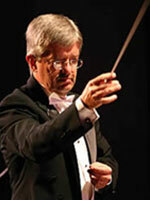 Leslie Hicken, Director of Bands, joined the faculty of Furman University in the fall of 1993. In the Department of Music, his responsibilities include the directorship of the Wind Ensemble, Symphonic Band, and Chamber Winds; instructor of instrumental conducting; instrumental music education coordinator; and assistant to the Marching Band. In addition to his duties at Furman, he is the Artistic Director of the Carolina Youth Symphony and the Director for the Furman Summer Lakeside Concert Series. In the fall of 2000, Hicken completed a residency with the public schools of Volta Redonda, Rio de Janeiro State in Brazil preparing a concert with their String Orchestra. Prior to his appointment at Furman, Hicken was the Director of Bands at Youngstown State University in Youngstown, Ohio. Under his leadership, Wind Ensembles from both Furman and Youngstown State have performed at state MENC conferences and regional CBDNA conventions. In addition to his duties at Youngstown State, Hicken was the director of the Youngstown Symphony Youth Orchestra and a clarinetist in the Youngstown Symphony Orchestra. Earlier in his career, Hicken was employed for five years as an instrumental music teacher in the Durham (NC) County School system. In addition, he served as a clarinetist in the United States Military Academy Band at West Point, NY. Hicken is a member of the South Carolina Music Educators National Conference, the College Band Directors National Association, the National Band Association, The International Clarinet Society, and the South Carolina Band Directors Association. He belongs to Phi Kappa Lambda, Phi Beta Mu, and is an honorary member of Kappa Kappa Psi and Phi Mu Alpha Sinfonia. He received his Bachelor of Music degree from the Eastman School of Music, a Masters of Arts in Teaching from Teachers College, Columbia University, and a Doctorate in Music Education from Indiana University. He studied clarinet with D. Stanley Hasty, Leon Russianoff, and Bernard Portnoy; and conducting with J. Marion Magill, Robert Klotman, and Ray Cramer. Hicken has received the Outstanding Bandmaster of the Year Award in 2000 and the Outstanding Contributor Award in 2002 from the South Carolina Chapter of Phi Beta Mu. In 2002, he was inducted into the American Bandmasters Association.